Composed in 1976 and revised 1991 and 2010, this canzone consists of five sections, with the transitions between the individual sections each being denoted by a general pause. The hymnodical motifs of the first section (Moderato cantabile) are revisited and further developed in the fifth section. The second section (Allegro vivace) reappears in the fourth section in exact reversion. The twelve-tone theme of the second section is repeated seven times, building in intensity of ever greater complexity and climaxing in a canonical exchange between the two halves of the ensemble. The initial pizzicato passages of this section are elements of the twelve-tone theme. In the fourth section, the theme is developed in reverse order: from the force of the two-part canon to the fading pizzicato passages. The three choirs of the third section (Andante semplice) create a midpoint of the canzone that is very subdued. A motif reminiscent of a chorale in the low choir is echoed by the high choir and followed by an imitative dialogue, over which the middle choir weaves the augmented hymnodical motif of the first section. Shortly before the final phrases of the canzone in the fifth section, the twelve-tone theme of the second and fourth sections returns one final time as a pizzicato episode, simultaneously as the theme and in reversion. Six cellos each play in two choirs. The most salient feature is the rhythmic dialogue and the harmonic elements arising from the interwoven sound of both groups. 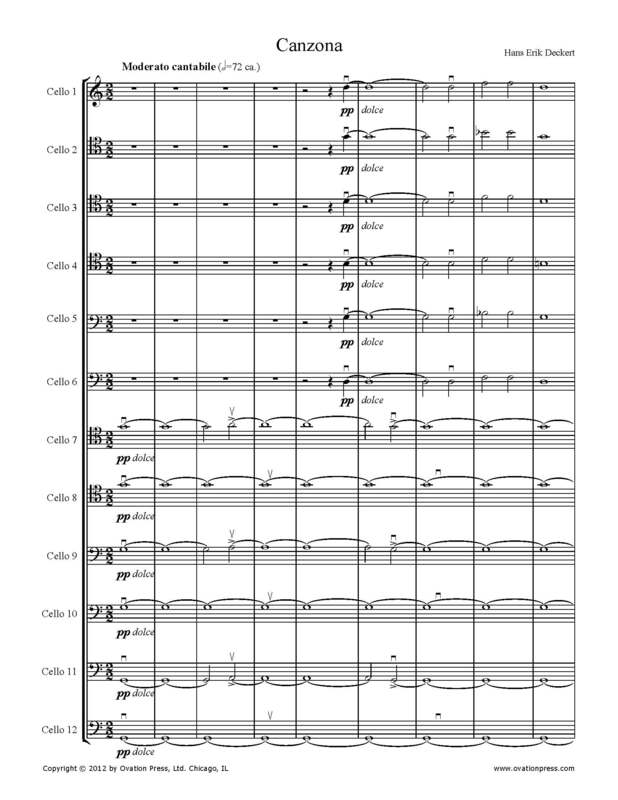 In this section, the basic thrust of the musical expression is established by six dual formations: 1st/2nd cello, 3rd/4th cello, 5th/6th cello, 7th/8th cello, 9th/10th cello, 11th/12th cello. These dual formations play the twelve-tone theme one after the other with significant rhythmic differentiation, the 11th and 12th cellos beginning at rehearsal number 6, followed by the 9th and 10th cellos at rehearsal number 7. They are accompanied by elements of increasing complexity, unfolding both in duet as well as in quartet form. An example of such a quartet can be found at rehearsal number 8 (1st - 4th cellos), which accompanies the theme played by the 7th and 8th cellos. Here a chord sequence, carried by the uniform rhythm of the quartet, builds as a marked contrast to the theme. At rehearsal number 9, where the 5th and 6th cellos have the theme, the effect begins to intensify. The 7th - 10th cellos now provide – again through a uniform rhythm – a compact harmonic substrate for the theme, while the 11th and 12th cellos initiate constantly increasing rhythmic activity through distinctive eighth note passages. Then, at rehearsal number 10, all the musical elements of rehearsal number 9 (5th - 12th cellos) transition “up” (3rd - 10th cellos); the theme has now passed on to the 3rd and 4th cellos, while the accompaniment intensifies through additional eighth note passages played by the 11th and 12th cellos. Likewise, at rehearsal number 11, all the musical elements of rehearsal number 10 (3rd - 12th cellos) transition “up” once again (1st - 10th cellos); the theme finally passes to the 1st and 2nd cellos, while the accompaniment achieves even greater intensity through the rhythmic and “cutting” sustained tones in octave intervals within A2, A3, and A4 in the 11th and 12th cellos. At rehearsal number 12, the ensemble divides into two “aggressive” groups, driving the theme in a two-part canon to its culmination, whereby the rhythmic structure of the theme comes to a dramatic climax. There is uniform rhythm in the three quartets: 9th - 12th cellos (lower quartet), 1st - 4th cellos (upper quartet), and 5th - 8th cello (middle quartet). The lower and upper quartets offer a constant imitative interplay using a motif reminiscent of a Phrygian chorale, while the middle quartet renders an augmented version of the opening motif of the canzone in four octaves. The harmonic contrast within the individual quartets as well as that among the three quartets themselves is very subtle. For this reason, it is especially vital to pay close attention to intonation. As already stated, this section is the exact reversion of the second section. For this reason it is the responsibility of each cellist to determine the pertinent developmental processes of the second section and practice them accordingly! This radical structure results in musical textures that are totally different! The rhythm in particular is fundamentally changed, as is the thematic feel. Only the harmonic elements will be at all recognizable, albeit in reverse order. Thus, the rehearsal dynamics are fully unique compared to the second section! More than anything else, the same things stipulated for the first section apply here. The gradual fading of the opening motif during the development in the measures between rehearsal numbers 29 and 30 requires a greatly subdued sound. Especially prominent here is the episode that immediately follows at rehearsal number 30, where the twelve-tone theme of the second section is revisited by the 7th and 8th cellos playing pizzicato, while the inverted theme of the fourth section – likewise pizzicato – is simultaneously heard from the 9th and 10th cellos. What is of the essence here is not only the overall rhythm structure resulting from the rhythmic interplay of the thematic voices, but also the consequent weaving together of the harmonic strands. This is followed by the final, mellifluous conclusion of the canzone.